The Worm needs to go back into his hole, or back to the bottom of the tequila bottle from which he came. In other words Dennis Rodman just needs to keep quiet. 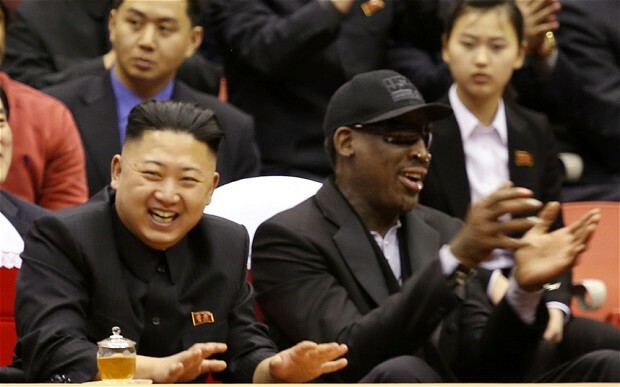 Rodman recently visited North Korea with a few Harlem Globetrotters for a goodwill/exhibition basketball game. That’s fine, but what has become of it, is just ridiculous! 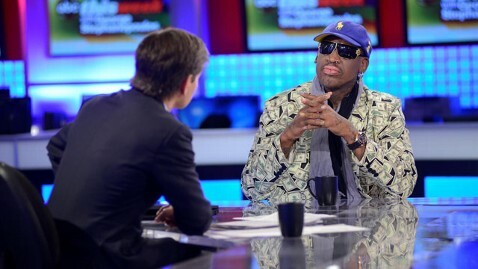 Rodman spent his time hanging out with North Korea’s dictator leader Kim Jong Un, and says that he’s a pretty good guy. The Worm told Kim, that Kim’s dad and grandfather were great leaders. What??!! Kim Jong Un is responsible for the continuing state of disarray his country is in, and has recently sent out threating remarks stating that he will launch a preemptive nuclear strike on the U.S. because of new sanctions against his country. The new sanctions are not just something that was done on a whim…it’s because North Korea keeps on breaking the rules, and need to be kept in check. Anyone remember Hitler, and how that escalated. According to Rodman, all his new “guy pal” wants to do is talk hoops with President Obama. That may very well be the case, but it’s idiotic. He wants to talks sports and not World Politics, c’mon…it just shows where Kim’s priorities are. I get it, no one wants to have the spot light turned off of them, but there are other ways to do it… Dennis, the buzzer has sounded and the clock has reached 00:00. This entry was posted in NBA, sports and tagged Dennis Rodman, george Stephanopulos, kim jong un, President Obama, the worm. Bookmark the permalink. Dennis must be back on the juice. Why doesn’t he stay there with his little friend?